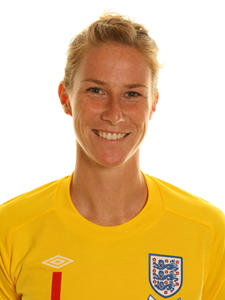 We’d like to welcome a new addition to the Welborn Social Media family – Karen Bardsley. Karen brings enthusiasm, passion and know-how to Welborn Social Media. Karen graduated from Cal State Fullerton with a degree in graphic design and has done an outstanding job marketing herself, the Women’s Professional Soccer League and women’s soccer. Karen is currently playing professional soccer in Sweden for Linköpings FC. She is a member of England’s National team, was the starting goalkeeper for the 2011 Women’s World Cup and is a 2012 Olympic hopeful for Team GB Women’s Football. In 2008 she left Apple to assist with the Women’s Soccer program at the University of San Diego before she was drafted in 2009 by New Jersey Sky Blue FC of Women’s Professional Soccer. She played there for three years until the leagues suspension in 2012. In November 2011, Karen began building the foundations for her coaching business, Reflex Goalkeeping. With her new business she plans on working with goalkeepers of all ages and skill levels. We’re excited to have Karen Bardley become a part of Welborn Social Media and look forward to using her skills and expertise to help the businesses we work with grow. Posted in People and tagged Apple, Cal State Fullerton, Coaching, England National Team, Goalkeeping, Karen Bardsley, Linkopings FC, New Jersey, Olympic, Sky Blue FC, Sweden, University of San Diego, Welborn Social Media, Women's Football, Women's Professional Soccer, Women's Professional Soccer League, Women's Soccer.